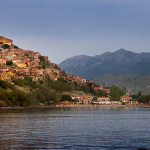 The Molyvos International Music Festival has launched an Indiegogo campaign to help fund its initivative to support music and culture on the Greek island of Lesbos. The festival is one of Greece's most prestigious classical music events, and the second edition, which takes place 16 - 19 August 2016, will feature 20 international musicians. The festival also runs a year-round educational project "The Music Key", organising workshops in schools across the island. This is a great project, and Classical:NEXT are proud to support it; you too can support the festival by pledging to their Indiegogo campaign now!